Seventeen years after Charlie Chaplin’s entrance into motion pictures (based upon the strength of his legendary drunk act), he produced his masterpiece, City Lights. The movie premiered in 1931, four years after the advent of talking pictures. Still, Chaplin decided to film City Lights as a silent, subtitling it “A Comedy Romance in Pantomime.” It is primarily the romance aspect of the film (including the deservedly famous “Yes, I can see now” finale) on which critics tend to focus. However, first and foremost, City Lights is a comedy, and the lion’s share of the laughs are generated by the dual drunk act of Charlie Chaplin and Harry Myers. The story is simple--Chaplin’s tramp encounters a blind flower girl (Virginia Cherrill), who mistakes him for a rich man through a circumstance that is ingenious in its simplicity (I’ll let you discover that for yourself). The tramp is smitten with the girl and wants to help her overcome her poverty and blindness, but he doesn’t have the means to help her. Fate steps in when the tramp prevents a drunken millionaire (Harry Myers) from committing suicide. The pair form a fast friendship during a liquor-soaked night on the town. Unfortunately, the tramp has difficulty putting the touch on the millionaire, because the alky blacks out whenever he’s sober. He only recognizes the tramp when he’s hammered. City Lights is simply Chaplin’s best film and one of the two greatest silent comedies ever made (the other being Keaton’s The General). Like most of Chaplin’s movies, much of the plot and slapstick were improvised on the set; and production would occasionally shut down as the director worked out story details. Although the production took nearly three years to complete, the final product appears effortless. Chaplin’s writing, directing, acting, and original score are all superb; and the contributions of non-actress Virginia Cherrill and comic Harry Myers approach perfection. In terms of comic set pieces and true emotion, City Lights is unmatched; and it deserves all of the superlatives that have been heaped upon it. Whether you are a fan of silent film or can’t stand old black and white movies, you’ll find it hard not to love City Lights. Potent Quotables--THE TRAMP: Careful how you’re driving. THE MILLIONAIRE: Am I driving? Video Availability--While the Warner DVD release of City Lights boasts better contrast and sharpness than the earlier City Lights (Image Entertainment) release, the Warner DVD trims the top and bottom off the frame in order to fit standard television dimensions. The out-of-print Image release is worth seeking out, because it preserves the film’s original aspect ratio. Similarly Sauced Cinema--Chaplin performed variations of his drunk act in numerous shorts and features, but One A.M. (1916) contains his greatest inebriated tour de force. Love Begins at Twenty is basically a W.C. Fields film without W.C. Fields. It contains all of the elements of the Great Man’s classic henpecked husband comedies You’re Telling Me (1934), It’s a Gift (1934), and The Man on the Flying Trapeze (1935)--a battleaxe of a spouse, turmoil at work, a devoted daughter, and a plot that gives the downtrodden “worm” the opportunity to “turn” through the aid of alcohol. In fact, one would expect that the writers had pilfered the storyline from the Great Man if it weren’t for the fact that the movie was based on Martin Flavin’s play “Broken Dishes,” which ran on Broadway in 1929. Hugh Herbert fills the Fields role as Horatio Gillingwater, a mild-mannered family man who is bossed at home by his domineering wife (Dorothy Vaughan) and at work by his crabby, skinflint boss (Clarence Wilson). The only person that appreciates the tenderhearted Gillingwater is his daughter Lois (Patricia Ellis), who hopes to marry and leave the nest. Lois’ mother refuses to consent to the marriage; but both Horatio and Lois’ fortunes take a turn for the better thanks to a bottle of hooch, which gives Horatio the courage to stand up to his wife, his boss, and a couple of gangsters (It wouldn’t be a 1930’s Warner Brothers film without gangsters). 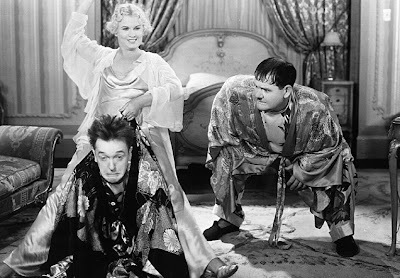 In the hands of comic genius W.C. Fields, Love Begins at Twenty could have been a comedy classic, but with Hugh “hoo-hoo” Herbert in the lead, the movie is merely a pleasant diversion. There are no big laughs in the picture, but the film is likeable, and at a brisk 58 minutes, it doesn’t wear out its welcome. All in all, Love Begins at Twenty is an interesting curiosity that proves that it’s near-impossible to fill the shoes of the great W.C. Fields. Potent Quotables--EVALINA: Horatio Gillingwater, you’ve been drinking! HORATIO: Oh, you’re crazy. I haven’t had a drink in months. What are you talking about? Video Availability--Never released on video. Similarly Sauced Cinema--“Broken Dishes” was adapted as a film two other times--before in 1931 as Too Young to Marry and later in 1940 as Calling All Husbands. However, instead of either version, I’d recommend you watch the similar W.C. Fields film, The Man on the Flying Trapeze (1935). Steve Buscemi is the modern-day equivalent of Peter Lorre. Like Lorre, Buscemi is the most recognizable character actor of his generation, and he is a talent capable of raising a movie’s class and entertainment value with the briefest of appearances. After building an impressive acting resume working for some of today’s top filmmakers, Buscemi decided to try his hand behind the camera. His feature writing and directorial debut, Trees Lounge, went on to prove that Buscemi is as adept behind the camera as he is in front of it. Buscemi portrays Tommy, an alky lowlife, who makes a habit of screwing up his relationships with females, friends, family, and employers. When we meet Tommy, he has plenty of reason to drink (not that he needs a reason), having recently been fired from his job by his former friend/boss, Rob (Anthony LaPaglia), for “borrowing” money from the till. Rob has also taken Tommy’s long-time girlfriend (Elizabeth Bracco), who is several months pregnant (likely with Tommy’s child). Rather than trying to reassemble the shreds of his life, Tommy spends the best part of his days and nights drinking in Trees Lounge, a dimly lit dive, populated by whiskey-sodden losers like himself. Although it appears that Tommy has hit rock bottom as the movie begins, the perpetual screw-up manages to find new ways to plumb even lower depths. 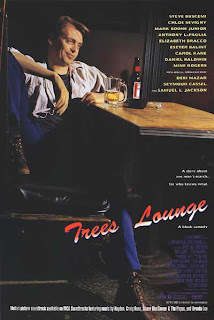 As a slice-of-life drama focusing on a fringe personality, Trees Lounge should be dreadfully depressing. Thankfully, it is anything but, due in large part to Buscemi’s colorful script which includes just enough quirky humor to keep the story from descending into dismal-land. Buscemi also knows how much a good character actor can add to a scene, so he has packed his film with the best in the business. Even the smallest, single-scene roles are assayed by the likes of Samuel L. Jackson, Debi Mazar, Michael Imperioli, and Seymour Cassel. Buscemi draws vibrant performances from his top-notch cast, and his direction is sure-handed, simple, and effective. One would never know that a first-timer was calling the shots. All in all, Trees Lounge is a tasty and satisfying cocktail. Rather than being a good first film, it is an excellent movie by any standard. Soused cinema enthusiasts should consider it required viewing. In short, it is the best bar movie since Barfly (1987). Potent Quotables--VIC: (pouring a drink): You’re a weak man. Similarly Sauced Cinema--Trees Lounge and Barfly (1987) are a perfect pairing for a lowlife dive double-feature. If you're a regular reader of Booze Movies, you already know about the 1st Annual Cocktail Film Fest that will be taking place at the W Hotel in New Orleans on March 21-22. If not, you can find the full information in this previous post. 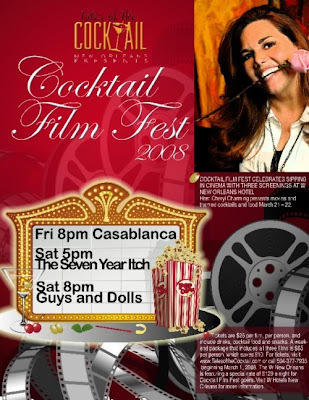 Lets make this event a booze-tacular success, so we can look forward to many more Cocktail Film Fests in years to come! 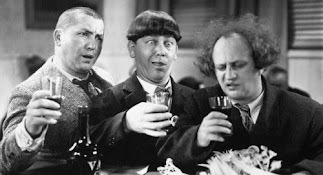 Many Laurel and Hardy films featured liquored laughs, but Stan and Ollie weren’t always the ones doing the drinking. Often the boys were bedeviled by an inebriate played by the dean of drunk character actors, Arthur Housman. The lanky, mustachioed Housman made his living portraying comic drunks, and although he was rarely given more than a few lines of slurred dialogue or some staggering background action, he became the most recognizable movie souse in the 1930’s. Throughout the decade, Housman’s “drunk” character showed up in dozens of films, but he is best remembered for a handful of pictures in which he shared screen time with Laurel and Hardy. Scram! was his first teaming with the duo; and it also turned out to be the best showcase for his legendary “drunk” act. The comedy commences in a courtroom, where Mr. Laurel and Mr. Hardy find themselves facing the ill-tempered Judge Beaumont (Richard Cramer) on a vagrancy charge. Rather than placing the boys in a nice warm cell, the judge gives them one hour to get out of town. 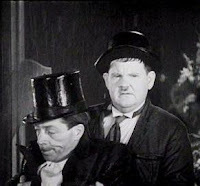 Stan and Ollie take to the road, slogging through the pouring rain, when they stop to help a drunk (Houseman) who has dropped his car key down a sewer grating. After multiple slapstick attempts to retrieve the key, involving all three participants falling into the hole beneath the grating, the dapper inebriate offers to put the boys up for the night in his stately home. Unfortunately, in his bleary-eyed state, the souse takes the boys to the wrong house. The drunk takes it on the lam when he realizes his mistake, but he leaves behind Stan, Ollie, and a pitcher of booze. Of course, when the mistress of the house faints at the sight of the intruders, the boys give her what they think is a glass of water. She immediately gets giggly gassed on the drunk’s liquor, and Stan and Ollie find themselves with another inebriate to deal with. I wouldn’t rank Scram! as one of the best Laurel and Hardy comedies. However, the physical slapstick between the boys and Arthur Housman is absolutely hilarious. It’s a shame that Housman was so often relegated to the background in other movies of the time, because Scram! proves that he was capable of stealing scenes from the best comedy talents in the business. Potent Quotables--MRS. BEAUMONT: What on earth was that, Hawkins? HAWKINS, THE BUTLER: Just a drunken man, Madame, that thought this was his house. MRS. BEAUMONT: Oh! It’s a good thing my husband wasn’t home. He’d have killed him. You know how he detests drunken people. Video Availability--You can find the short on DVD in the United Kingdom, Germany, and Holland, but it has not been officially released in the U.S. However, Hollywood's Attic provides a collector's copy in Laurel and Hardy Classic Shorts (Volume 8). Similarly Sauced Cinema--Arthur Housman also provided comic support to Laurel and Hardy in The Live Ghost (1934), The Fixer Uppers (1935), Our Relations (1936), and briefly in The Flying Deuces (1939).